Do your kids want to know more about the world? How about we start with our neighbor countries? For those of us in US, it means Mexico! Why Are We Learning About Mexico? Mexico is a US neighbor, and it’s interesting to see what is the same and different between our countries. California’s culture and everyday life has significant Mexican influence. Smarty’s school has many kids with their roots in Mexico. We are spending our spring break this year on a cruise heading down to Mexico. It’s a great opportunity to learn about this country from first hand experience, not just from the books. The books below are sorted from the ones appropriate for preschool and kindergarten to the ones better suited for older readers. Off We Go to Mexico by Laurie Krebs illustrated by Christopher Corr is a Barefoot picture book. Barefoot Publishing is famous for high quality multicultural books, and this one is not an exception. 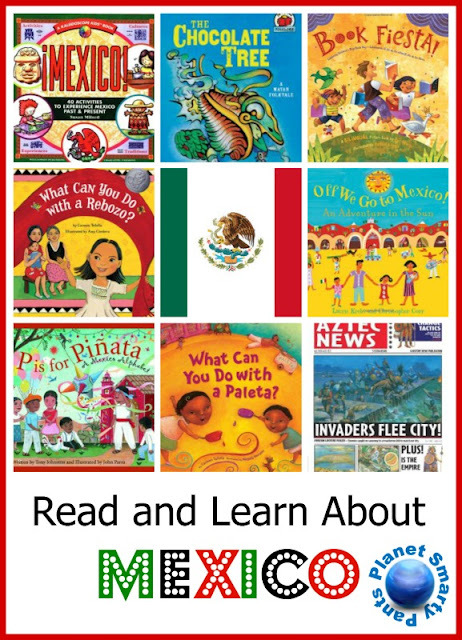 It’s a book best suited for preschool and kindergarten kids, and it takes a very brief look at Mexico highlights, but one can use it as a starting point to learn more about Mexico culture and geography. 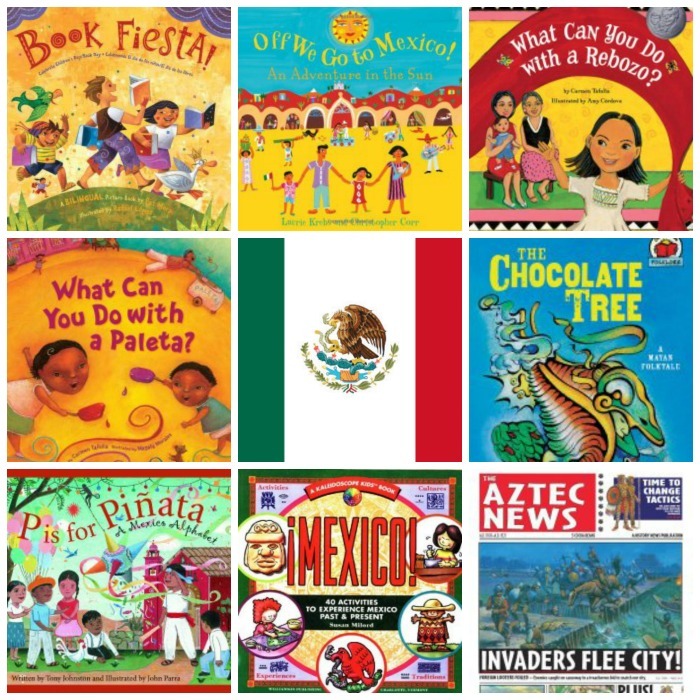 What Can You Do With a Paleta by Carmen Tafolla illustrated by Magaly Morales and What Can You Do With a Rebozo by the same author but illustrated by Amy Cordova are “sister books”. Children, starting with young preK age, can easily identify themselves with Mexican narrators in the stories who talk about things they enjoy and use in everyday life. Ironically, while everyone in America (or at least in California) knows about Cinco de Mayo, it’s really not an important Mexican holiday. Mexico celebrates its Independence Day on September 16th. I chose to include a book about a holiday that celebrates children and books – Book Fiesta by Pat Mora. This book is gorgeously illustrated by Rafael Lopez and tells a story of Children’s Day and Books’ Day that both fall on the same day in Mexico – April 30th. An additional bonus of this book is that it is bilingual and celebrates reading both in English and in Spanish. P is for Pinata by Tony Johnston is one of “two level” books from Discover the World series by Sleeping Bear Press. This book can work for young kids and for much older kids. Younger kids can read short verses for each letter and admire detailed and bright illustrations by John Parra. 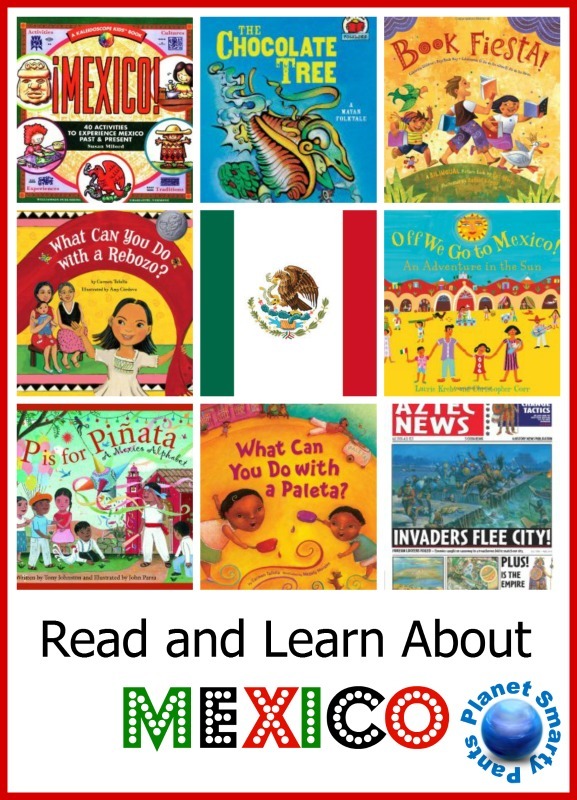 Older kids can read in-depth information included on every page about various Mexican highlights. Smarty was not interested in that level of information, but I read through details, found them fascinating and shared some with her. My daughter loves myths and I am impatiently waiting for The Chocolate Tree to arrive to our library from an Interlibrary Loan system. I am also looking forward to indulge her love of all things chocolate as we learn more about the birthplace of chocolate. I described this book in this post about The Magic of Chocolate. Smarty really enjoyed Roman News and Greek News from the same series, so I am looking forward to arrival of Aztec News from the library loan system. This non-fictional series is very clever in wrapping up a lot of facts about ancient cultures in the format of the modern day news magazine. We read the first one when Smarty was in the first grade, but she is a very fluent reader with high degree of interest in history. Generally, I would align with Amazon recommendations for these books – 9 years and up. The last on my list in a non-fictional activities book: 40 Activities to Experience Mexico Past and Present that would be good for someone planning a long unit study on Mexico. Some activities are very involved (3D map of Mexico!) and some are a lot more doable including several fun recipes. Smarty and I both looked through the book deciding what might be interesting to do for hands-on learning about Mexico. Chocolate! Hot chocolate, Mexican brownies, melt chocolates to make shapes (something that Smarty has been asking to do for a while). Corn. Believe it or not, we have never made popcorn before. Mexico study seems to be a good opportunity to try it out. Mud bricks. Another thing that Smarty wanted to do for a while. Listen to mariachi bands (hopefully, live on our vacation in Mexico) + on YouTube. I would love you to follow my new Mexico for Kids Pinterest board. I would also love for you to share your favorite resources about Mexico in the comments. We did Mexico for AWi12D a few years ago, and it was right around Halloween, so we learned about Dia de Los Muertos a little. Of course in Texas our Mexican information has a lot of Tex-Mex influence, A LOT. I can't wait to hear about your vacation, it sounds wonderful! I can't wait to hear about your trip! Emma is learning ballet folklorico in school this year. She especially loves the skirts! Oh, what fun!! We have read several books and tried some Mexican crafts to go with them. Thank you for sharing at Sharing Saturday! Pinning this!! Thanks for stopping by the Thoughtful Spot Weekly Blog hop! We loved Book Fiesta. It was a fun one! I will be adding a few others to our list based upon your recommendations.